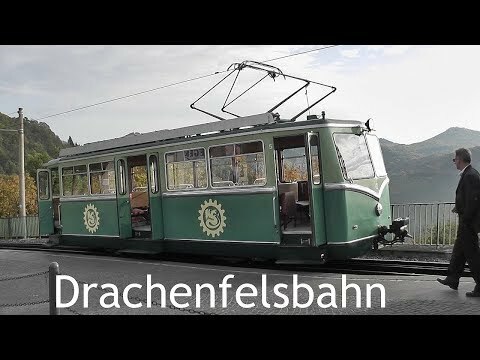 The Drachenfels Railway (German: Drachenfelsbahn) is a rack railway line in the North Rhine-Westphalia region of Germany. The line runs from the city of Königswinter to the summit of the Drachenfels mountain at an altitude of 289 m (948 ft). Besides the two terminal stations, an intermediate station serves the Schloss Drachenburg. The line is 1.5 km (0.93 mi) long and is single track. The Drachenfels Railway is one of only four rack railways still operational in Germany. The Drachenfels (“Dragon’s Rock”) is a hill of 321 metres (1,053 ft) in the Siebengebirge uplands between Königswinter and Bad Honnef. The hill was formed by rising magma that could not break through to the surface, and then cooled and became solid underneath. It is the subject of much tourism and romanticism. It overlooks the river Rhine. The ruined castle Burg Drachenfels, on the summit of the hill, was built between 1138 and 1167 by Archbishop Arnold I of Cologne and bears the same name. It was originally intended for the protection of the Cologne region from any assault from the south.